These are definitely the most unique instant noodles I have ever had. There is no specific flavor assigned to these, they are just "Instant Ramen Noodles" with a picture of a Merlin-esque wizard looking through a telescope. Weighing in at a miniscule 40g, these are a really tiny pack of noodles but could work well as part of a larger meal. The back of the package contains Uni-President's slogan, which is "A Kiss to the Spirit of the Future". These particular noodles are released with several different space themed cartoon images on the packaging like astronauts and planets. 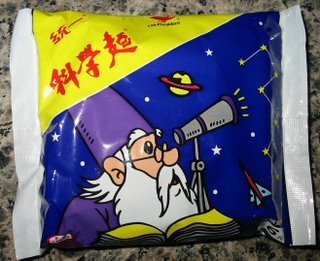 I happened to pick the wizard looking through the telescope, but I assume all the different space-themed noodles have the same contents. The amount of noodles is absolutely tiny, but that was OK because I was eating some leftovers with the meal. As you might expect, there is no distinctive flavor to these, as no particular flavor is even suggested by the packaging. It tasted a little bit like garlic and salt, but nothing was overwhelming. The noodles themselves were quite good. Like most Taiwanese noodles, they were extremely soft and flavorful. The noodles had almost a nutty flavor to them which I think comes from being fried in palm oil. All in all, these noodles were pretty good, but could only serve as a small piece of a bigger meal. I did really enjoy the packaging, though! A few weeks ago, I was sorely disappointed by the Nissin Demae Ramen - Spicy Flavor. These are quite similar to those so I was a little wary going in. 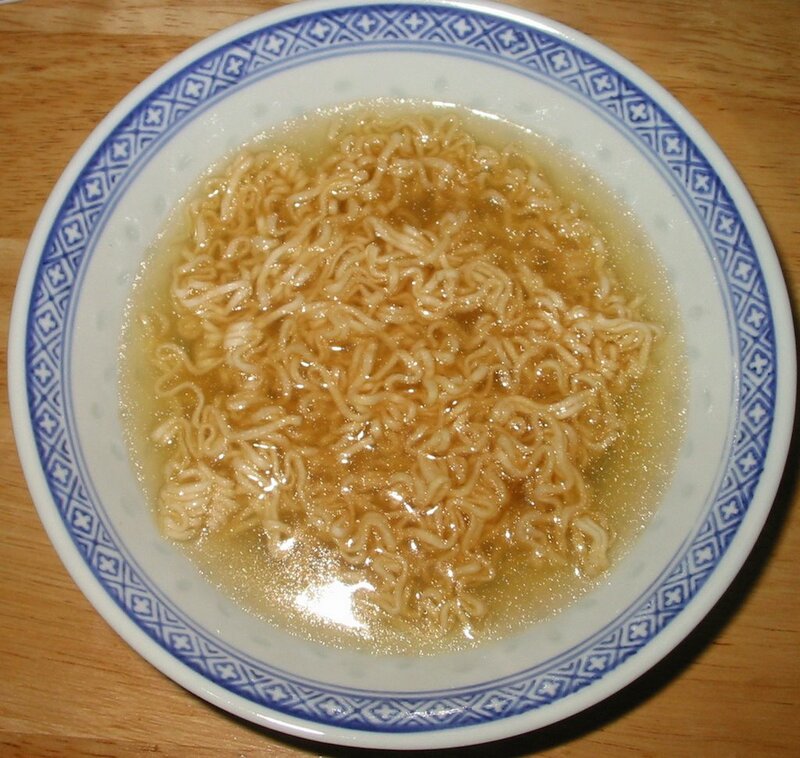 The Nissin Demae Ramen had just not been spicy at all and lacked much flavor at all. 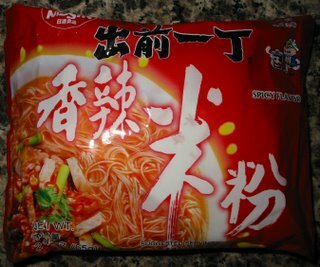 But I have had good success in the past with Nissin Spicy Flavor noodles so I was willing to give this type another try. The packaging is very similar to the packaging for Nissin Demae Ramen, even down to the little cartoon boy carrying a box of noodles. This pack of noodles is different because it is vermicelli instead of ramen. 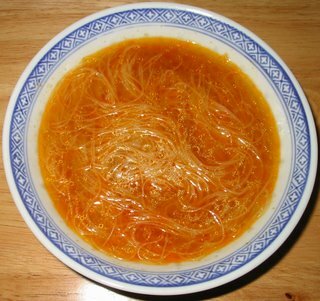 Vermicelli is a very thin strand of rice noodle that is amazingly absorbent. Because of their huge absorbent properties, these 65g of noodles seem to fill you up more a little bit more than they should. 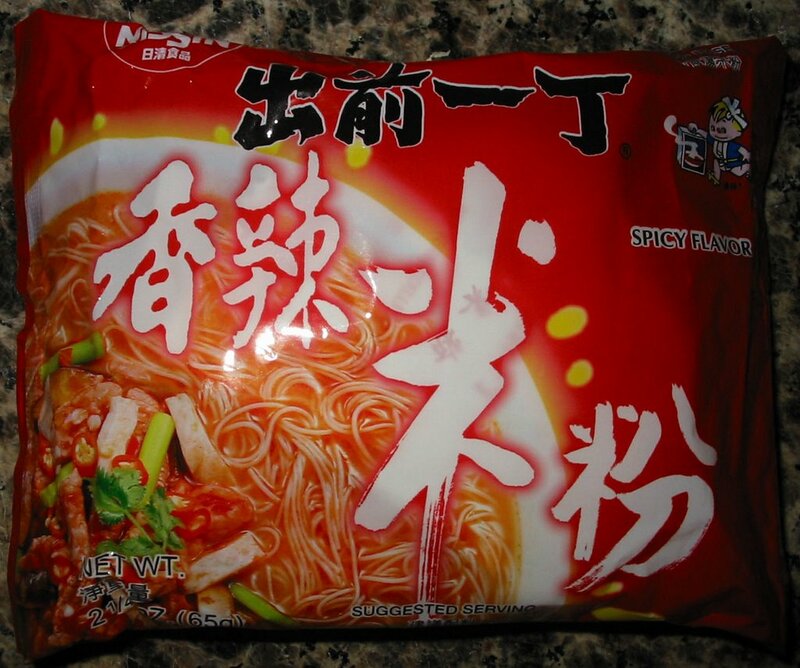 Unlike the Ramen variant of these noodles, this pack became nice, red and spicy. There is not much flavor to these except for the heat, but that is expected since they are labelled as "Spicy Flavor". The vermicelli tend to stick to each other which is a little annoying, but hardly the fault of Nissin. If you try to pick up a few bite-sized strands to eat, chances are the whole ball will stick to it and get pulled out of the soup. After experiencing these, I can only surmise that my previous negative experience with the Nissin Demae Ramen - Spicy Flavor must have been the victim of a packaging mistake and lacking the hot oil packet.